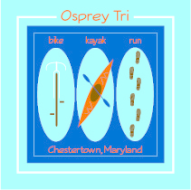 TCR Event Management, a division of TriCycle and Run LLC, was happy to provide timing services for the 2017 Osprey Triathlon (BIKE, KAYAK, RUN) to benefit The Kent School in Chestertown, MD. While the weather threatened to dampen the event, we made it through the entire event with just a light drizzle. Congratulations to all the participants, both individual and relay team members. If any participants wish to know if we were able to capture your individual leg splits, please feel free to email us at laura@tricycleandrun.com.